The complete guide to all the best restaurants and places to eat in Bordeaux! Where to Eat in Bordeaux For centuries Bordeaux has been famous for producing many of the world’s best wines. Today Bordeaux is known for more than just wine. In fact, now Bordeaux is a true food and wine lovers paradise. But that was not always the case. Until recently, Bordeaux was not known for as a culinary destination. In large part, this was due to the fact that most of the fine dining in Bordeaux took place in private dining rooms at the various chateau. The reasons behind that was were simple. Because the city of Bordeaux was so far away, the chateaux preferred to host their important guests at their estates with private chefs in their dining rooms. Those days are gone as Bordeaux is now one of the world’s most popular tourist destinations for its beautiful architecture, history, wine, food and the famous chateau. When choosing where to eat in Bordeaux today, there are a myriad of choices at every level of dining imaginable. You can find some of the best bistros France has to offer. And there are now several Michelin starred restaurants as well. Some of the world’s most famous chefs have either opened up their own restaurants or become partners with top chateau owners or hotels. 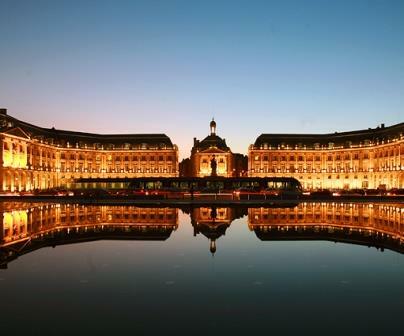 Most of the movement to Bordeaux from famous chefs has taken place in the city center of Bordeaux. Where to eat in Bordeaux in the City Center Joel Robuchon may have been the first famous chef to change where you desire to eat in Bordeaux when he joined forces with Bernard Magrez (The owner of countless chateaux including Pape Clement) at La Grande Maison. However, Joel Robuchon did not remain with La Grande Maison long. He was quickly replaced by the famed, Paris chef, Pierre Gagnaire. La Grande Maison is now a 2 star Michelin restaurant. They are hoping to gain their 3rd star. Gordon Ramsay was next in line to open in Bordeaux when he signed on to take care of the fine dining at Le Grand Hotel de Bordeaux with Le Pressoir d’Argent. To make Le Pressoir unique, Gordon Ramsay focuses his menu on local Bordeaux ingredients like caviar from the numerous local rivers, oysters from Arcachon and beef from Bazas, which pairs perfectly with the wines of Bordeaux. Le Pressoir d’Argent recently earned its second Michelin star. 2 other new restaurants that are getting a lot of attention are Solena, which features seasonal menus and Cote rue, which has a hip, modernist leaning. Les Racine is another new spot that is getting a lot of notice from locals and visitors. Across the street from Le Pressoir d’Argent, the former Michelin starred chef from Hotel de Plaisance in St. Emilion, Philippe Etchebest is now at Le 4 eme mur, close to the opera house. World famous celebrity chef Alain Ducasse is rumored to be opening a venue in Bordeaux as well! And this does not even begin to take into consideration all the great bistros and smaller, but no less wonderful places to eat in Bordeaux these days. It’s funny to think about, but it was not all that long ago when Bordeaux was not known for fine dining. Today, that is no longer the case. Les Belles Perdrix, Le Chapon Fin, Cordeillan Bages, Le Davoli, Le Gabriel, Garopapilles, La Grande Maison, Hostellerie de Plaisance, Le Pavillon des Boulevards, La Petite Gironde, Le Pressoir d’Argent-Gordon Ramsay, Le Prince Noir-Vivien Durand, Le Saint James and Le Quatrieme Mur. La Tupina remains a popular destination for American visitors for its bistro-styled cooking and it’s open on Sunday night, when many, if not most places to eat in Bordeaux are closed. Garopapilles, headed by Tanguy Laviale, who was the former personal chef from Chateau Haut Bailly, is another great idea for fine dining in the city with their restaurant and wine shop/wine bar. Julien Cruege, a new hot spot in the city center is worth the visit. Another new wine bar that just opened in the city center is the aptly named Le Millesime, which also offers a tapas menu. For a wine bar focusing on affordable Bordeaux value wines, try Un Chateau En Ville, started by the owners of Lestrille, from the Entre Deux Mers appellation. At the beautiful Musee d’Art Contemporain, (The Museum of Contemporary Art) open only during the day, there is Cafe Andree Putman which is placed on the museum’s terrace, else, if you’re hungry stop in at Cafe de la Musee or the nearby Septieme Peche. If you’re strolling in the city and you’re in the neighborhood of the famous Bordeaux Cathedral, located directly across the street is Le Bistro du Musee. Try and get a seat on the terrace which offers great views of the city. Another idea for views could be the Cafe du Port for its vista of the waterfront and le Pont Saint Pierre bridge. All that being said, if a view is what you’re seeking, perhaps the best view in all of Bordeaux can be found at Restaurant Le 7, located on the 7th floor at the top of the new museum, La Cite du Vin, which is perhaps the world’s best visitor center, dedicated to wine. If the weather is nice, try to get one of the few, seats on the terrace, for stunning views of the river and the city of Bordeaux. While much of the attention of the press on where to eat in Bordeaux is focused on high-end dining at starred Michelin restaurants, the city is packed with fine bistros. For a few tips on where to eat in Bordeaux when you’re hungry for more traditional choices in the city, (even if a few are Michelin starred) there is Le Chapon Fin, which also features one of the best wines lists in all of Bordeaux. You can also try Le Gabriel and Brasserie l’Orleans, which are also both great, traditional, French choices. In January, 2019, the owners of Chateau Angelus purchased the Michelin starred Le Gabriel, located in the famous Place de la Bourse, in the heart of the city center in Bordeaux. Le Gabriel offers both, gastronomic and bistro styled dining. If you’re looking for upscale Chinese food, with a refined, French touch to its Cantonese styled cuisine, Dan is a great choice. Au Bonheur du Palais is another top foodie destination for Asian inspired cuisine in Bordeaux. Madame Pang, located not far from the famous Place de Bourse is also winning over fans of great Chinese food lately. In the city of Bordeaux, locals often dine at La Brasserie Bordelaise, Le Petit Commerce and Bistro l’Exploit. Using local ingredients in a new creative fashion, Cote-Rue, situated close to the Musee d’Aquitaine is rapidly gaining new fans as is Miles. With a menu designed around local, south west French produce and ingredients, Belle Campagne is a new establishment that is worth going to. If you’re in the mood for a decent place to eat, with a very good wine list that even offers wines from regions other than Bordeaux, check out L’Univerre. L’Univerre also has a wine shop attached to the restaurant. Le Flacon does not rival the depth of wines offered at L’Univerre, but the selections are excellent and it makes for a fun place to dine. Just outside the city center, Le Saint James in Bouliac is another popular spot for food and its strong wine list. If you want to enjoy a sublime cheese cart, Jean d’Alos, located in the Chartrons district is your destination of choice. Also in the Chartrons district, Les Tables Vatel Bordeaux offers a relaxed, palm tree filled, courtyard setting with a nice wine list. While much of the restaurants in Bordeaux focus on meat, fowl, fish and potatoes, as that often pairs well with wine, today, there are several new restaurants catering to vegetarians, or just customers with a passion for locally grown produce. In the city center, Le Comptoir de Seze and Racines offer several great vegetable choices. Rest’O, is a full, vegetarian restaurant. For more casual vegetarian options Greedy and The Kitchen Garden should be fun places to eat. Where to Eat in Bordeaux when visiting Chateau in the Medoc While you are in the middle of the wine country, there are several vineyard, adjacent choices for where to eat in each appellation. Starting from the south in Margaux perhaps the most popular spot where many of the locals and winemakers dine is the popular, traditional bistro, Lion d’Or. You can also try; La Gare Gourmande, Le Savoie, Brasserie du Lac and the bistro inside the hotel, Relais de Margaux. In St. Julien my favorite place to dine remains Le Saint Julien, which is a must visit for fresh, grilled dishes. If the weather permits, make sure you ask to be seated in the patio, with the great outdoor grilling station. Chez Meme is another fine choice that the locals often dine at. For lunch, next to St Julien in Cussac, many of the locals and winemakers enjoy Le Bontemps, which combines the best elements of bistro and Japanese cooking. If you are seeking to visit a cooperage, (Barrel Maker) before or after lunch, Brasserie Le 1902, owned by the popular barrel maker Tonnellerie Nadalie in the Ludon-Medoc makes for a nice afternoon. The best places to eat in Pauillac As you continue traveling north, one of the most famous restaurants in the Medoc for fine dining is at Hotel Cordeillan Bages, which remains as good as ever. Cordeillan Bages, owned by the Cazes family of Lynch Bages fame is located next to Chateau Lynch Bages. Cordeillan Bages offers high-end, gastronomic cuisine. For more casual dining in Pauillac, Lavinal in the Bages village is a fine, traditional bistro. For something different, Montevideo offers Spanish styled cooking. There are also several, casual cafes located due north in Pauillac, on the waterfront. For example, Le Saint Martin and Le Pauillac. Inside the Hotel Angleterre, you’ll find Le Vignoble France and for places to dine with people that live in and work in Pauillac, including many winemakers, try La Bodega de Victor, Bistrot La Raffinerie and Brassiere de L’Union. If you find yourself hungry and you’re in St. Estephe, there are a few choices with views of the river. One of the top destinations in the appellation remains Le Peyrat. If you’re in Pessac Leognan and looking for where to eat, there is Chateau Leognan and of course La Grand’Vigne, which is located next to Smith Haut Lafitte at Les Sources de Caudalie. La Grand’Vigne is a 2 star Michelin restaurant situated in Martillac. For something more casual, there is a nice, small bistro next to the lake in Leognan, La Maison au Lac Bleu. It is located about 2 minutes from Domaine de Chevalier. Else, as you’re close to Merignac, which is where the Bordeaux airport is located, ther are several options. In Merignac, at the high end, there is L’Iguane, Le Clos d’Augusta and Le Pavillon de Boulevards. For more casual, French cuisine, L’appArt, Le Bistro, Bistro du Grand Louis and Le Fils should fit the bill. If you’re seeking Asian food, Le Tri Delice in Merignac is the place to go. Where to eat in St. Emilion If you’re planning to visit the Right Bank of Bordeaux, in St. Emilion, the choices continue expanding giving you several fabulous dining choices for lunch and dinner. For great restaurants with 100 Pt. views, Les Belles Perdrix at Troplong Mondot, which can now boast that it’s a 1 star Michelin restaurant. The terrace at Hostellerie de Plaisance, a 2 star Michelin restaurant cannot be beat for amazing views of the region. Hotel de Plaisance is owned by the Perse family that also own several Right Bank vineyards including Chateau Pavie. La Terrasse Rouge at La Dominique, which provides great bistro inspired food and a sublime view of the vineyards. Logis de la Cadene, owned by the de Bouard family of Angelus is another sublime, fine dining destination. in 2017, Logis de la Cadene just earned its first, Michelin star. If you want to dine where the wine makers and other locals go in Saint Emilion, Lard et Bouchon, Chai Pascal and L’Envers du Decor are all worth the visit. L’Envers du Decor was recently purchased by Gerard Perse, of Chateau Pavie. L’Atelier de Candale, with its outdoor setting is another dining spot to consider in St. Emilion, as is Le Bistrot des Vignobles, with their quaint, outdoor patio seating on a warm afternoon. If you want to eat in the village where the locals like to dine, try Le Tertre, L’Huntrier-Pie, Chez Germaine, Les Delicies du Roy, Les Giron’dines, Le Clos du Roy and Hotel Le Grand Barrail are all in the village. Chateau Trianon opened a new hotel and restaurant that is gaining great notices. If you enjoy a moderate drive, just outside of Saint Emilion, many producers dine in the neighboring city of Libourne, the business center of the Right Bank. Libourne is a small bustling city with a great, outdoors farmers market. In Libourne, my favorite spot is Chez Servais, with its traditional, seafood dishes. Because Libourne is a fairly busy city, there are several choices on where to eat. For other spots you can try: Restaurant du Lac, Grill d’Etrier, Le Zinc Authentique, Cosy Tourny, La Villa Vietnam, La Table de Catusseau, Le Jeremy and La Plancha d’Olive. About 10 minutes away from Saint Emilion, but in the opposite direction in Branne is Le Cafee Cuisine. Just a little bit of a drive from Libourne, and not that far from St. Emilion, you should go to Le Clos Mirande in Montagne Saint Emilion which offers great vineyard views. In nearby Fronsac, La Dauphine is the place to go. Or if you’re willing to drive about 30 minutes, check out l’Atmosphere in the Entre Deux Mers appellation. Not too far from the city of Bordeaux, Le Saint James in Bouillac, which is now a 1 Michelin star is another hot spot, worth the visit. Where to eat in Sauternes and Barsac If you’re in the mood for dishes that pair perfectly with the sweet, white Bordeaux wines, in Sauternes, Auberge Les Vignes and Saprien are the 2 best places, older, established places to go. In 2018, 2 new restaurants debuted in the region. Chateau Lafaurie-Peyraguey opened a new fine dining establishment, aptly named “Lalique” with a Michelin starred chef. The restaurant earned its first Michelin star by early 2019! The owners of neighboring Chateau Guiraud opened La Chapelle de Guiraud, which is also well worth the visit.